The 7th Annual Web Manger University’s Government Web and New Media Conference was surely a sign of the times. 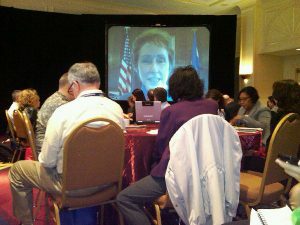 When the GSA Administrator was unable to give the welcome address as the schedule had originally planned, she appeared on the big screen through Skype. Audience members started a “twitterfall” by tweeting various quotes and topics throughout the conference using the hashtag #govwebcon. Yesterday, in a standing room only ballroom in the Renaissance Hotel in Washington D.C., federal, state, and local government professionals, executives from private sector companies, as well as press gathered to kick-off this two-day conference. David McClure, the Associate Administrator in the Office of Citizen Services of GSA, said, “Sometimes government-wide solutions are not so popular, but they are in general better for the public,” during his welcome address. He went on to explain how a government-wide solution gives the government one face, one common image, and is more efficient for the public. Certainly every agency has a different way of measuring their online efforts. However, McClure hopes this conference will be a way for agencies to step outside of their “agency boxes” and work together to come up with new solutions. He reminded audience members the importance of gathering regular feedback from customers and more importantly, incorporating that feedback. When Martha Johnson spoke to the audience through Skype, she reminded the conference attendees that GSA is an asset to the administration and its mission is to supply expertise to clients (each government agency) so they can deliver on their own missions. What is GSA’s focus for the moment? Innovation. Johnson continued to explain how GSA is in a good position to manage risk as a solid centralized agency. They are able to do innovative experiments and labs, practice with upgraded technologies and act as a change agent. In terms of open government, Johnson believes the biggest challenge is how to be collaborative. She “wants to push the frontiers on collaboration” and wants GSA to be an example for other agencies.